Solid State Chemistry is concerned with preparation, characterization, property measurement, and device testing of extended organic, inorganic, and hybrid compounds. 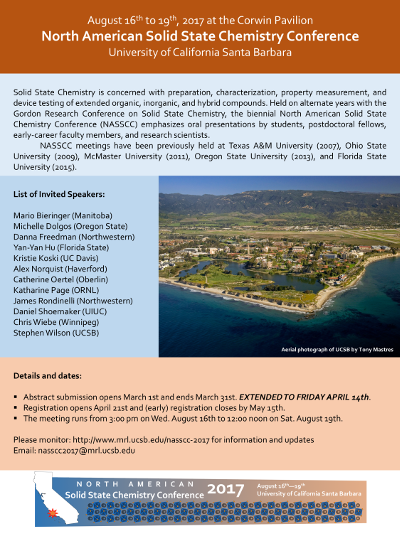 Held on alternate years with the Gordon Research Conference on Solid State Chemistry, the biennial North American Solid State Chemistry Conference (NASSCC) emphasizes oral presentations by students, postdoctoral fellows, early-career faculty members, and research scientists. NASSCC meetings have been previously held at Texas A&M University (2007), Ohio State University (2009), McMaster University (2011), Oregon State University (2013), and Florida State University (2015). • Abstract submission opens March 1st and ends March 31st. EXTENDED TO FRIDAY APRIL 14th. Abstract template here . You might need to right-click, file save-as to download the .docx. • Registration opens April 21st and (early) registration ends May 15th. • The meeting runs from 3:00 pm on Wed. August 16th to 12:00 noon on Sat. August 19th. For questions regarding the NASSCC 2017 conference, please contact nasscc2017 [at] mrl [dot] ucsb [dot] edu .